For newlyweds, combining furniture and collections they each value, as well as decorating styles to create a cohesive home they both love, can be quite the challenge. 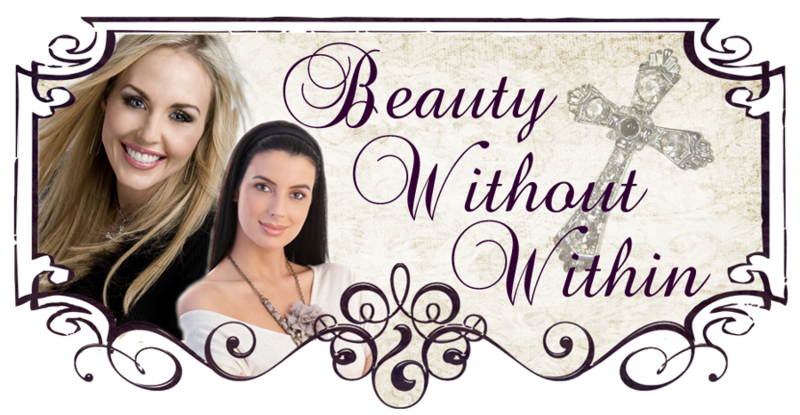 Blending two disparate looks, contemporary/traditional, masculine/feminine, can be a source of conflict for many couples. But, often coming up with an interior design that satisfies both styles can create some of the most interesting and satisfying results. Gloria was married to her first husband for 45 years and had been a widow for six years before meeting Rusty, a divorcee for a number of years. Gloria's late husband was very handy around the house, making and building just about anything Gloria wanted, but couldn't have cared less about the decor. Therefore, she did all the decorating according to her tastes and style, filling the house with traditional furniture and lots of blue and white. Rusty was a landscaper for many years with an eye for design and love for original art. His former wife is an artist and they collected a lot of art together. After the divorce, Rusty kept many pieces that meant a lot to him and continued collecting art that caught his eye. He also has very distinct decorating tastes and ideas. Rusty is not only a large man physically, but he also has a large personality, and leans toward large, masculine furniture suitable for entertaining. So, how do two people with their own furniture and collections, and such different decorating styles, tastes and backgrounds come together in a new home and a new marriage? 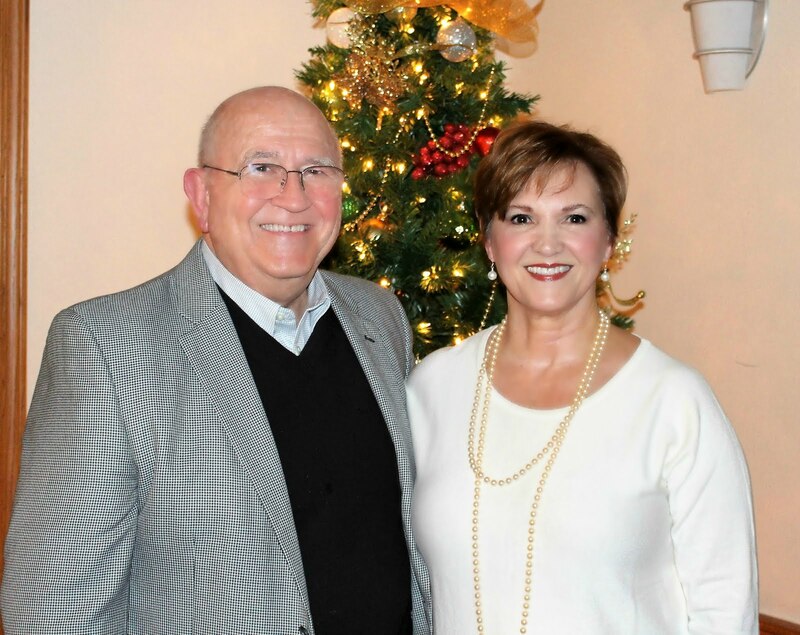 Fifteen months ago, Rusty and Gloria said their vows and for "better or worse" began combining what meant the most to them. This blog post is not only how they did that, but the results. Prior to the wedding, they purchased this new home and began the process of furnishing it. Upon entering the home, it becomes evident that art is the unifying theme and yet it was the most difficult thing for them to reconcile. 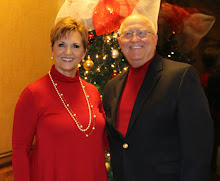 Both Rusty and Gloria brought treasured paintings into this union. Yet, because of their diverse decorating styles, their art collections and family pictures have become the common denominator in decorating their home. They have learned the best approach to pleasing both of their individual tastes is to purchase only those items they both love. Of course, another secret is compromise. The result celebrates both favorite possessions and a mutual respect for each other. Because the couple does share a love of antiques, before the wedding, they made a trip to Arkansas where they found many antique pieces they both liked. One such find was the dining room furniture. The ends slide out making it easy to entertain large groups. The compromise started in the dining room with Gloria displaying paintings by her paternal grandmother over the antique sideboard that Rusty especially loved. Gloria found this information about her artist grandmother and put it together with this treasured picture. The antique Tea Box was a gift from Gloria's former boss of many years. Inside the sideboard, along with Gloria's china is her mother's crystal stemware. A Plain Dealing, La. artist, Beverly Anderson, and a distant cousin of Gloria's painted this depiction of her paternal grandparent's home in Plain Dealing. Her grandfather actually built this home in 1906 and it still stands. Gloria honestly confessed that when Rusty brought this painting into the house, her initial feelings were, "Not in my house!" But, after learning that the painting was done by a local artist friend of Rusty's, Mike Dean, whose talent was well known and respected in the area, she now loves having it hang in the entry. In the living room the curved sectional sofa covered in brown leather, is not only practical for Rusty and his LSU buddies who love to have game nights here, but also its shape and color play perfectly with the artwork above and the color balances the dark wood of the mantel and built-ins. The gallery wall in the living room has been a joint effort between them and contains mostly favorite paintings from Rusty's collection. On the far left is one they purchased together in New Orleans. 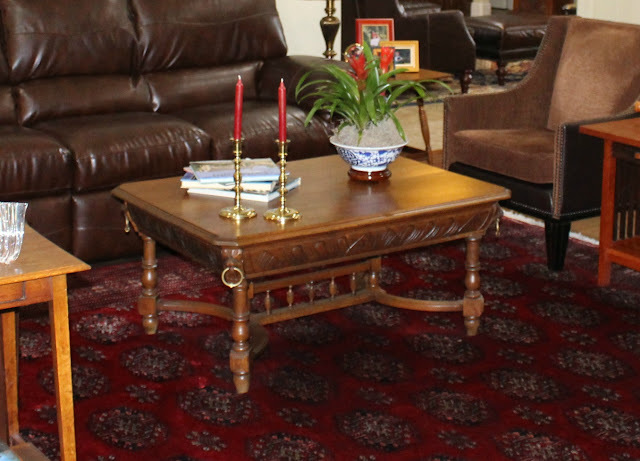 The large oak coffee table was another joint find from their antiquing trip. It was once a library table that had been cut down. I love the rich details. The beautiful table in front of the large windows was another piece they both loved. And here you begin to see some evidence of Rusty's willingness to compromise with Gloria's love for Blue Willow. On one of the shelves by the fireplace are these two pictures. On the left is Rusty's deceased sister and the other is Gloria at about the same age. Although Gloria never got to meet his sister, the many pictures keep her memory alive. These two watercolor paintings add such a bright spot to this wall. The top one is Rusty's done by Bill Bryant and the smaller one is Gloria's done by Renee Webb. These two very interesting sketches are from Rusty's prized collection. The top one was done by an artist in New Orleans. The lower one is of particular significance. The subject is "Don Quixote" done by Salvador Dali. 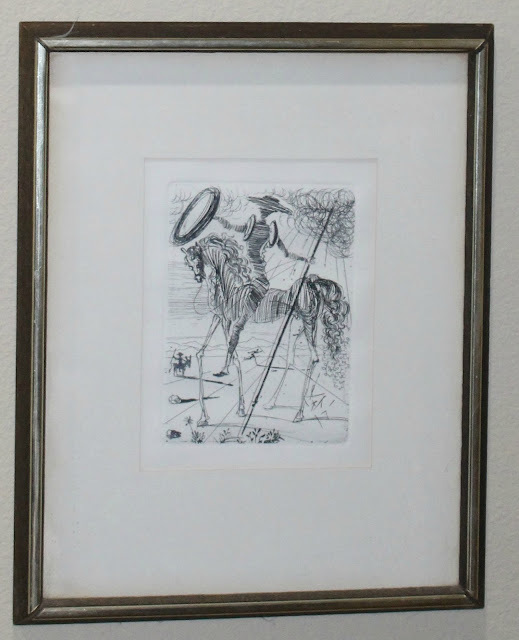 It is an original etching, signed in the plate, from his Spanish Immortals series and a classic example of masterly technique. Dali will be hailed as one of the major art influences of the 20th century and his works are in every major collection and museum in the world. In the hallway leading to the master suite is this collection of pictures of Gloria and her parents. She still has that radiant smile by the way. On the wall just inside the bedroom is this grouping. The large center picture is of Rusty's mother done by a German artist while the family was stationed there many years ago. There are also pictures of Rusty and his dear sister. The little desk was built by Gloria's grandfather for one of her aunts and it was been passed down through the family until finding its home here. On the desk along with old family pictures is an old school book that once belonged to Gloria's father dating back to 1920 - "Billy Goats Gruff." Gloria has used family pictures as a means of sharing their lives prior to meeting. This is so important in unifying their past and making it part of their present. The focal point of the master bedroom is this huge cypress, king-size headboard that Rusty purchased many years ago from a skilled craftsman in Natchitoches, La. They have recently commissioned him to make specially designed night stands to match the headboard. Gloria told me that Rusty searched a long time to find the exact chair that would fit him for this intimate sitting area. He finally found this beautiful chair and agreed on the red leather upholstery. 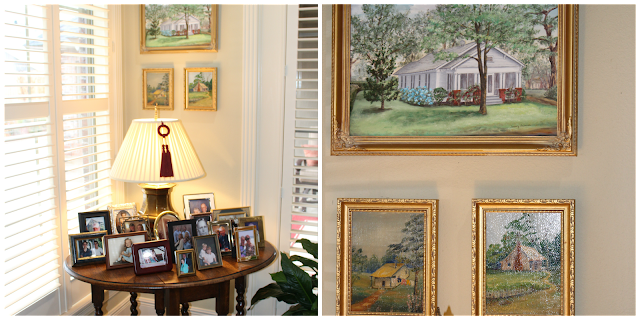 In this area are also groupings of family pictures one of which is Gloria's favorite of Rusty. It is from his school days at LSU. This home is really an artist lover's retreat - extremely personal, not too stuffy, and easily updated as collections and styles change. This grouping will continue to evolve when the lower painting finds its permanent home on the patio. Gloria's eye for detail and need for order is exemplified in this room. I could be so happy here! One of the changes they made to the house was to add a door from the closet into what was a bedroom, turning it into a work-out room. This expanded the master suite to include that entire side of the house. A Jack-and-Jill bath connects the workout room to another bedroom that Gloria has made her own personal space. Here she displays art, family pictures and memorabilia that is especially meaningful to her. On the opposite side of the house, Gloria's traditional bedroom furniture has found a home in the guest room. Above the night stand is a painting from a memorable hiking trip in Switzerland with her late husband, done by a fellow hiker and local artist. The large, spacious kitchen and family room is where Rusty and Gloria spend most of their time and where guests want to gather. Rusty loves to cook so this was a drawing feature of the house to them. Gloria told me that they searched long and hard for the chairs in this family room. They needed something that would be comfortable for Rusty's large frame and her small one. In a bright corner is a table laden with family snap shots. Above it hangs a painting also done by Beverly Anderson of Gloria's family home in Plain Dealing, La. The round breakfast table belonged to Rusty's grandmother. The other pieces he purchased to go with it. It is here that Gloria has used many of her Blue Willow pieces. She has inherited and collected antique plates and bowls over time, so not all of them match, but the mix of blue-and-white patterns makes for a lovely, relaxed atmosphere in this bright breakfast room. The two plates below were her grandmother's and the tea set was a gift. Compromise and the joining of favorite pieces is displayed with Gloria's Blue Willow platters with one of Rusty's favorite pottery pieces. Again, Gloria was not sure that this item belonged in the house although it was very special to Rusty, until she realized what a conversation starter it was. 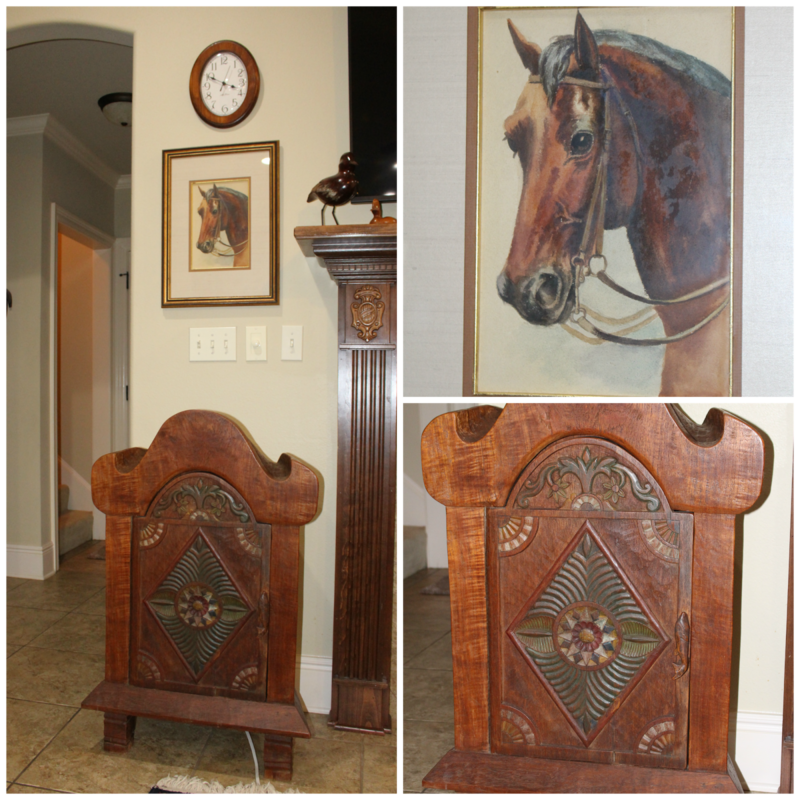 This unique cabinet was used by Rusty as a wine cabinet and reportedly was carved from one large piece of wood, It certainly is an interesting item. Above it hangs Gloria's favorite painting done by her artist grandmother. This horse painting is the only watercolor they know of that she did. The staircase landing is an open gallery space for Gloria's on-going display of favorite pictures from both their families. On the second level is another guest room and bath that continues to evolve. On the quilt rack is a quilt made from squares by Gloria's great grandmother. She and Rusty have opened their home as a Bed & Bath retreat for traveling PEO Sisters and this remote suite is perfect for visiting guests. Rusty put his landscaping skills to work by completely re-doing all the landscaping and specifically the back yard. It was a lovely place on this rainy day, so I can only imagine what it will look like come spring and summer when Rusty will be bringing in plants from his greenhouses. As you can tell, Rusty and Gloria like an orderly life, and this beautiful, calming, well organized home full of art and family is obviously no longer "my style and your style" but two shared styles. Since we aren't having the Wednesday Hodgepodge this week, and I am in the groove for a Wednesday blog post, I thought I would share my most recent project with you. I wanted to create a little sitting area in my rather small master bedroom. There are times that I just want to sit there to read or watch TV while Hubby studies in the office. Besides, as I told Hubby, we sometimes just need a cozy place to have a serious conversation. He is not too happy about that idea, needless to say. I found this really neat leopard print chair that goes with my furniture just about perfectly. I already had the throw pillow. Once I got the furniture placed, I realized the little sconces that I had on that wall were entirely out of proportion for this grouping. That would never do! So, what else but to paint a picture to tie it all together. This past Sunday afternoon, I set about accomplishing that task, and am pretty well pleased. I love how the lamp light emphasizes the gold tones in the paint and casts shadows in all the right places. A better close-up shot of some of the details. The canvas size is 24"x36". I am very pleased with the overall affect and think I accomplished my goal for a nice intimate setting. Do you have a sitting area in your bedroom? If so, do you use it? Have you thought about how you might create an area with items you already have on hand? Or, do you need to look for that just-right piece that pulls it all together?